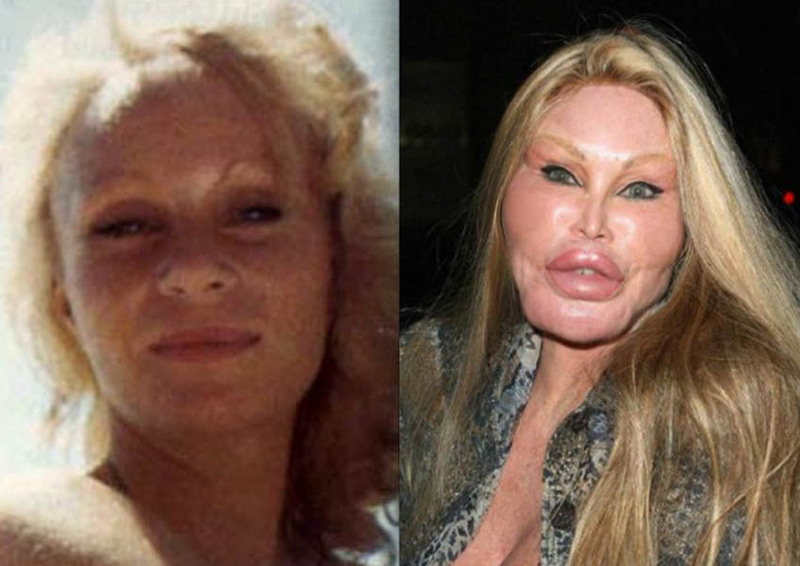 Jocelyn Wildenstein, popularly recognized as the Catwoman does not need photo comparisons, experts or confessions to prove that she has had extreme plastic surgery. How many times has she gone under the knife? – No one knows for sure! It has been rumored that Jocelyn got addicted to plastic surgery after her marriage with billionaire art dealer Alec Wildenstein hit the rocks in the late 90’s and she wanted to save it. Mrs Wildenstein has an undying love for the feline family and favours cheetahs and lynxes on her 66,000 acre Kenyan ranch. Her combined obsessions for plastic surgery and cats pushed her towards taking extreme steps to mould face with feline features. The Catwoman is not only addicted to plastic surgery, but open and happy about her obsession. She believes that plastic surgery gives her more confidence. Despite being dubbed the ‘Scariest celebrity in the world’ recently, Catwoman continues to her look every now and then – in pursuit of that perfect catlike beauty. Cheeks that jutt out, oversized protruding lips, eyes stretched up to a teardrop shape – all these may be difficult for us to stomach, but for Catwoman – this is beauty enhanced! It is also rumoured that the Catwoman has spent more than 4 million dollars on plastic surgery. Her routine procedure includes, but are not restricted to – eyelid lifts to keep that catlike eyes stretched, silicon filler injections to keep her lips, chin and cheeks plumped and of course facelifts with a little help from Botox. The latest rumour has it that Jocelyn is trying to turn it down a bit and get back into a more human look – for which she is depending on plastic surgery again.